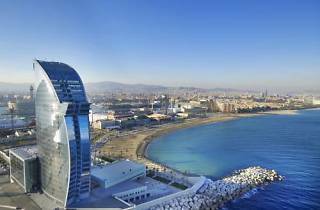 Towering over the lower end of Barcelona’s beaches, this luxury hotel offers all you need for a great time that combines relaxation and fun. From stunning views across the sand and sea to restaurants, bars, pools and a spa, you may be hard-pressed to find a reason to leave during your stay. 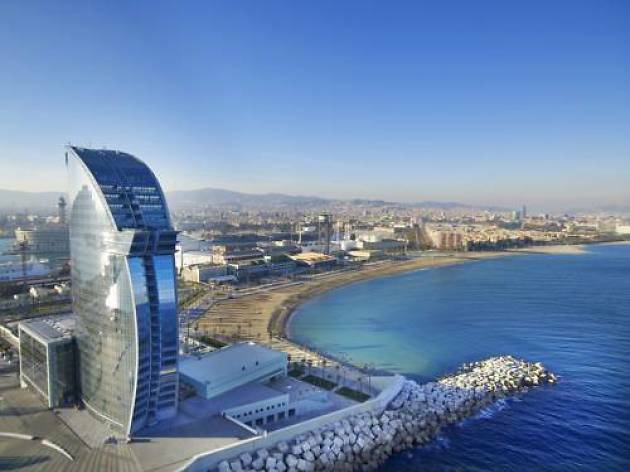 This striking contemporary hotel sits at the most southerly point of Barcelona’s some 4 kilometres of beach. Thanks to its appearance (which could also be said to resemble three-quarters of a silver lemon slice), the W Hotel is known locally as ‘La Vela’, or ‘The Sail’, and it’s a fitting nickname for this five-star accommodation that offers stunning views of both the city skyline and the Mediterranean horizon. This is a place where the details count, and there are numerous different services to experience; indeed, far too many to list here. We’re talking two pools, two restaurants, four bars (including one on the 26th floor and two in the lobby); private cocktail classes, guest DJs, exclusive poolside cabins. There’s even a range of Ricardo Cavolo limited edition sneakers, for goodness sake! The whole vibe is luxury glam in a place set apart from the crowds and stresses of the city centre, so if you want a break surrounded by beautiful people where your every desire can be catered to right there, this is the hotel for you. Location: Its beachfront position is clearly one of the W’s big selling points (viz. the positioning of beds for contemplating the views), and it's close to beach bars, places to do water sports, and a variety of restaurants. However, bear in mind that it also means a 10 or 15 minute taxi or bus ride to the centre of town; you could walk it, although that’s not recommended during the hotter months. Cable car: If you can drag yourself away from the hotel views, just a few minutes’ walk away from the hotel you'll find the 78-metre Sant Sebastià tower from where you can take the port cable car for a whole other range of incredible vistas. El Suquet de l’Almirall: Paella restaurants are as numerous in this area as they are varied in their quality. For an authentic taste of sticky savoury rice and top-notch local produce, this should be top of your list. Museu d'Història de Catalunya: Take a stroll along the waterfront of the leisure port, admiring the private yachts that are like hotels in their own right as you go, to the Catalan History Museum, situated in a former dock warehouse. Surf House: A taste of the Californian lifestyle right on the beach of Barcelona. Healthy fast food, wave-inspired cocktails, and daily activities including free paddle surf, beach workouts, and packs that combine water sports, yoga and food. Good for: Young luxury lovers (without kids) looking for a stylish place to stay that gives easy access to the beach and seafood restaurants of the local area, and are prepared to make the effort to get to the shops, eateries and bars at the heart of the city. Time Out tip: While you may not be planning to leave the hotel much during your stay, we do recommend a walk along the seafront to check out the works of art installed there. From the slightly sinister ‘A room where it’s always raining’ (Plaça del Mar by Sant Sebastià beach) to the towering cubes of ‘The injured star’ (Sant Miquel beach) and Frank Gehry’s glistening fish in front of the Hotel Arts, take them all in as you head out to enjoy drinks or food by the sea.